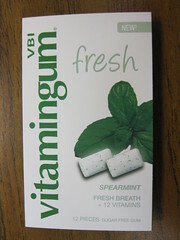 I am a chronic gum chewer, so I was quite excited to receive samples of Vitamingum Fresh from Vitaball, Inc. I must admit that I don't take a regular multivitamin (even though I'm pretty sure I have a bottle in the medicine cabinet) because I try to take in my vitamins through my diet, but the idea of vitamin gum is certainly appealing. Vitaball sent 3 flavors of Vitamingum Fresh: Spearmint, Peppermint, and Cinnamon. I'm starting with Spearmint, because it was my favorite. 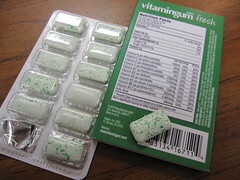 Each 2 piece serving provides 10% daily value of 12 different vitamins, and something I noticed while sampling the gum was that I didn't compulsively pop piece after piece of gum, knowing that I could overload on vitamins. That's good - just ask my dentist. At first, the tablets were firm, but after a little chewing, the gum softened to a pleasant, bouncy texture. The gum was intensely minty, cool, and refreshing - great for morning coffee breath - and had a nice spearmint flavor. Unlike Trident Vitality Vigorate, I didn't feel like I was chewing medicine or cough drops. Since I'm not a nutritionist or doctor, I can't comment much on the vitamin aspect, but as a gum, Vitamingum Fresh is pretty good. The fresh flavor lasted a long time (weakening after 5-10 minutes, with a milder mint hanging around much longer), and the texture was right on. Check out another review at Gum Alert!